What is a PLC ? PLC's are considered an approach or process rather than a model of professional learning. Key characteristics include: shared values and vision, collaborative culture, focused on improving student learning outcomes, supportive and shared leadership, and shared professional practice. In the Ontario educational context, direction for PLC's is explored in Professional Learning Communities: A Model for Ontario Schools. PLC's are foundational approaches for collaborative teacher inquiry and teacher learning and leadership program. Personal and/or professional learning networks are about making connections and building relationships with people or organizations that can answer questions, provoke your thinking, encourage you when things are difficult, or simply chat with when you have something to share. The focus in a PLN is on learning - yours, theirs, collectively gaining expertise. The network is local, regional, national or global in nature. Building your PLN is an essential tool for those new to the profession of education, or new to a grade, district, position or responsibility. Managing and updating your PLN regularly is one way to ensure you can connect, find and be supported throughout your learning journey. What is a PLN? 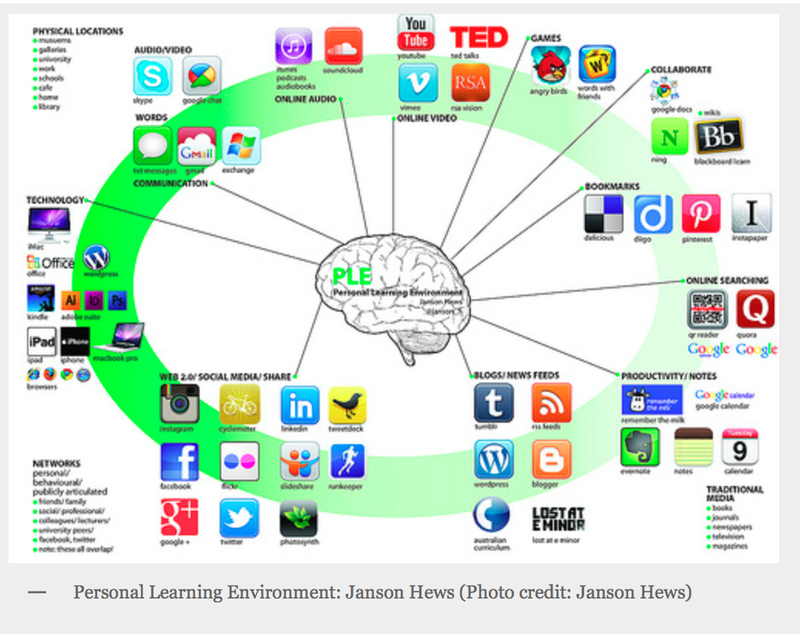 OR, PLE vs PLN, posted by A. Couros, Dec. 19, 2008. Personal and professional learning environments are the connected tools and resources you rely on to do your 'work' of teaching and/or learning. These tools and resources are immediately available in your context and environment. One image that provides a model for organizing your PLE is shared HERE - it includes laboratory, watering hole, campfire, cave and show-off. Think about all the tools you would use in each of these types of learning spaces. Create your PLE with these learning spaces in mind, using MINDOMO. Try to insert images for the specific tools you use in the physical or digital spaces. 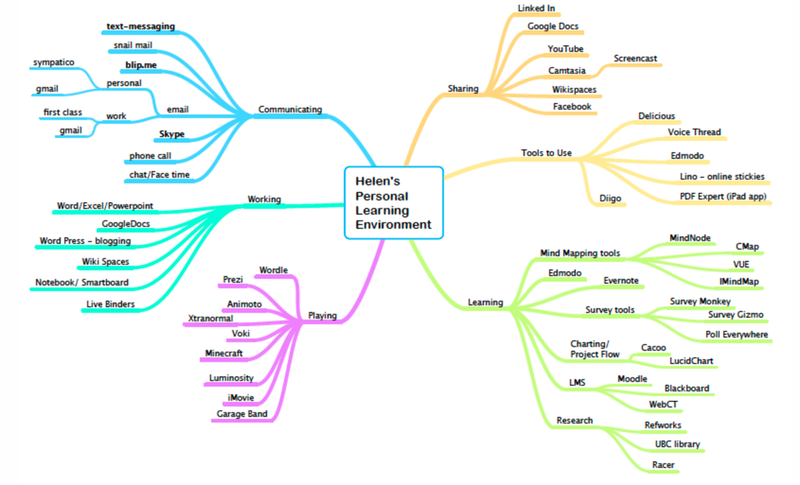 How to Create a Personal Learning Environment to stay relevant in 2013, posted by Debbie Morrison, Jan. 5, 2013. Using these two samples as a model for a PLN/PLE image, take some time to create a personal learning network for your teaching practice as it looks today. You can add any and all connections, organizations, interests and digital tools your are currently applying to your teaching & learning.